NEW Living Sea Sculpture Aquatic Biorock ™ art, fostering communities of living organisms above and below the surface. NEW ReefDoctor is a UK-based, non-profit marine conservation organisation implementing marine management, education and social development work with local fishing communities in Madagascar. NEW Natural Currents, is a leading US clean technology company with a primary focus on marine tidal power generation systems. NEW Espace Bleu is a private company working to preserve coral reefs in French Polynesia. With GCRA and local resorts located in Bora Bora and Moorea, Espace Bleu develops Biorock® programs. NEW Windjammer Resort and Beach Club featured the world record dive and will install a Web Camera focused on GCRA’s solar power buoys. Blue Seas Courtyard offers the charm of an old world Mexican courtyard in an idyllic Florida beachside setting and home to a major Biorock project. Vŏnē Research is a 501(c)3, non profit organization comprised totally of volunteers who devote their time: To increase public awareness of Florida's maritime history and oceanic resources. To work in conjunction with governmental and other like-minded agencies to provide research, conservation, preservation and education with respect to our oceanic, historical and archaeological resources. Vone Research is GCRA’s local partner in the construction, installation, monitoring, maintenance, and repair of Biorock projects. The Gili Eco Trust is a local NGO which protects both marine and land environment of the Gili islands in Indonesia, with the local association of marine security SATGAS. It uses a leading-edge Coral Reefs Restoration Program based on Biorock® technology. Rigs-to-Reefs Information. What is Rigs-to-Reefs and how does it relate to the mission of the Minerals Management Service (MMS)? The Coral Goddess, a living artwork dedicated to the health of our seas. This award-winning Karang Lestari coral reef restoration project uses Biorock® technology, a method that takes advantage of a gentle electrical charge to enhance coral growth and survival rates. "Swim around" author/diver Paul Mila's website for entertaining dive fiction, you-tube links of exciting underwater encounters, and more! Undercurrent, The private, exclusive guide for serious divers, Since 1975. Big Game fish Parasites Lucy Bunkley-Williams and Ernest H. Williams, Jr.
Biorock™.Net A method of enhancing the growth of aquatic organisms, and structures created thereby. Community Commitment.net, Site highlights information about organizations which are doing exemplary and innovative community service work. Coral Reef Ecology - Information on coral reef monitoring, imaging and analysis. Dive Training Magazine is diving’s education-based magazine for new divers, divers in all levels of training, their instructors and those who own and operate dive centers. Environmental Planning & Design, LLC (EPD) provides expertise in sustainable development technologies. FishBase- Fish biology, taxonomy, population dynamics, ecology, species lists. Friends of Hanauma Bay, Dedicated to conservation of coastal/marine environments, emphasizing stewardship of the natural resources found in Hanauma Bay, Hawaii. Friends Of Tobi Island, Tobi is a small coral island nearly 400 miles northeast of Koror, the capital of the Republic of Palau. Geothermal Aquaculture Research Foundation, Inc., Provides a showcase collection of aquatic plants, fish, reef animals and products. Great Barracuda Pages, More than you want to know about barracuda. Guide to Protecting Coral Reefs -EDF conservation overview. ICLARM: Home Page - International Center for Living Aquatic Resources Management. A broad range of research projects in developing countries. International Marinelilfe Alliance, IMA works to end human influences that degrade and destroy the world’s marine environment. Island Resources Foundation, an environmental non profit organization that works on environmental problems of development in small tropical islands. Marubis (Mariner Arten- und Biotopschutz e.V.) is a German non-profit organization dedicated in the protection of coral reefs, other marine biotopes. Marine.maps.main.html-Maps of coral reef areas. Overview of several recent Caribbean coral diseases. The Marine Education Trust website. The Marine Education Trust (MET) helps communities discover and understand the marine environment. Marine Foundation, Projects involve creating living coral sculptures using the Biorock® reef restoration method. NAUSICAA¤ -French National Sea Experience Center, in Boulogne-sur-Mer (Northern France), is a Science Center entirely dedicated to the relationship between Mankind and the Sea. Non-Destructive Coral Health Monitoring Home Page - Coral health monitoring via induced fluorescence. 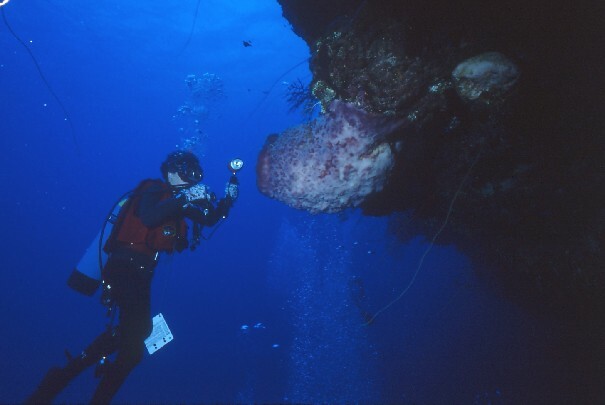 Nongeniculate coralline algae - Ecology and classification of crustose coralline algae. Parasites of Puerto Rican Freshwater Sport Fishes, (English) Lucy Bunkley-Williams and Ernest H. Williams, Jr.
Parasites of Puerto Rican Freshwater Sport Fishes, (Spanish) Lucy Bunkley-Williams and Ernest H. Williams, Jr.
Pew Fellows Program in Marine Conservation, Regarded as the world's preeminent awards for marine conservation. Project Aware, Conserving underwater environments through education, advocacy and action. Project LISA (English) (Italian) Innovative techniques for conservation and enrichment of underwater ecosystems on Italian and Mediterranean coasts. Reef Relief Founders.com. The new website features blogs on reef news, science and even offshore oil, along with images of coral reefs in the Florida Keys, Jamaica, Cuba, Bahamas and elsewhere. SAVE GUANA CAY REEF, Save Guana Cay Reef" is a group dedicated to protecting this natural wonder and ensuring that there is a long lasting legacy for Abaconians. Scuba Diving Directory - Worldwide dive resources. Support Marine Environmental Conservation. Shifting Baselines. The truth about ocean decline. The EnvironMinute, A 60-second radio feature heard domestically in the U.S. on over 150 radio stations and internationally on VOM and Armed Forces Radio. The JMS Relief Fund: In the wake of the Asian tsunami disaster, the JMSRF has endorsed the BioReef concept. Project planning is underway for the deployment of BioReef structures in Khao Lak, and the Similan Islands, Thailand. The Law of Nature Foundation is the international name of the Batas Kalikasan Foundation, a network of volunteer citizens working for the conservation, protection and restoration of the Earth, especially that patch of the sea unparalleled in its beauty and bounty-- the Visayan Seas. Vetiver Farms, implements natural and permaculture methods utilizing domesticated animals and plants to minimize dependency on fossil fuels. World Conservation Monitoring Centre - Sustainable management, databases, maps, and statistics.